I really hate carpet. Unless it's carpet for my backyard, in which case I love it. 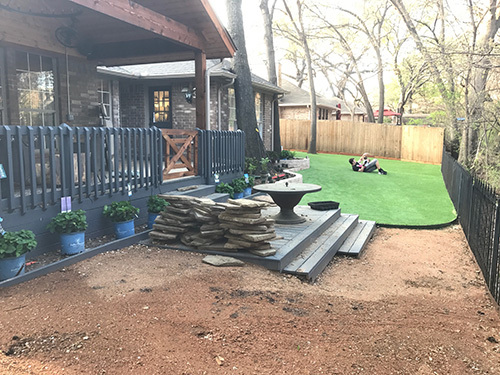 We spent the last 6 weekends giving our backyard a huge makeover with outdoor carpet - synthetic grass, to be exact - and I'm so pumped to show it to you! 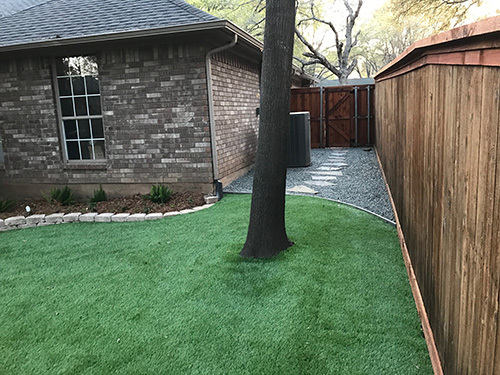 We've been tossing around the idea of installing fake grass, or "turf," as my football coach husband likes to call it, in our backyard for years. Our neighborhood was constructed in an old tree farm, and the huge shade trees around every house are a huge part of the appeal. Not so appealing, however, is the fact that our backyard is so shaded that we are unable to grow any grass. We asked around the neighborhood, and everyone else has the same problem. 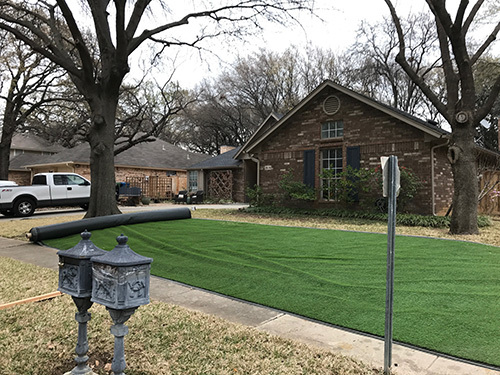 Many have tried and failed, and we haven't wanted to spend money installing a sprinkler system and laying sod only to have it die within a few months. We couldn't figure out a great solution that was cost effective, so we let our backyard sit in its embarrassing state as a giant dirt pit for the first three years we lived here. 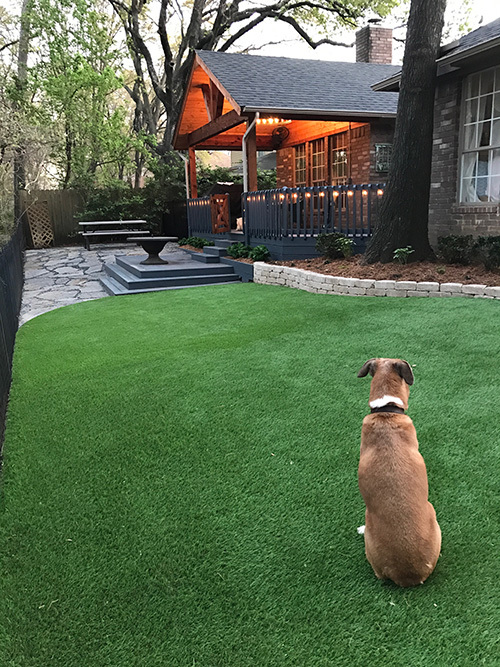 This past summer while working on our fancy schmancy patio cover and outdoor living room, we finally decided we would bite the bullet and install synthetic grass. Once we had kids, we really wanted to have a backyard we could use. I say "bite the bullet" because synthetic grass is not cheap! The husband and I went back and forth on whether to pay someone else to install the grass or whether he should do it himself. He had no experience installing turf (and I argued that he didn't have the time to do it now that we had twins), but he was having a hard time stomaching the hefty installation price tag. We wanted to complete both the patio cover and grass installation last summer, but it was just too much work to finish before football season. (Husband is a football coach so he basically disappears in the fall.) We decided to split the project into Phase 1 (patio cover/outdoor living room) and Phase 2 (synthetic grass/landscaping) and tabled Phase 2 indefinitely. At the beginning of January, we decided we would throw a big first birthday party for the twins. At the same time I told the husband, "Wouldn't it be nice if we actually had a backyard for the party?" His eyes lit up at the prospect of doing the yard makeover, and before I knew it he was spending all of his spare time watching turf installation videos. He was determined to do it himself to save us the money. I decided that he had never let me down on his previous projects so I would just trust him to do quality work with the backyard project, too. Spoiler alert: He did not let me down. In fact, he blew me away with the amount of work he was able to complete and how professional it looks. Here's where we started at the beginning of February.WHAT A WRECK! Dirt, weeds, dirt, leaves, more dirt. Scott knew he needed more manpower to do the project, so he hired two of his former football players who were willing to work with him on weekends. 1) The first step was to excavate the backyard and level the dirt as much as possible. 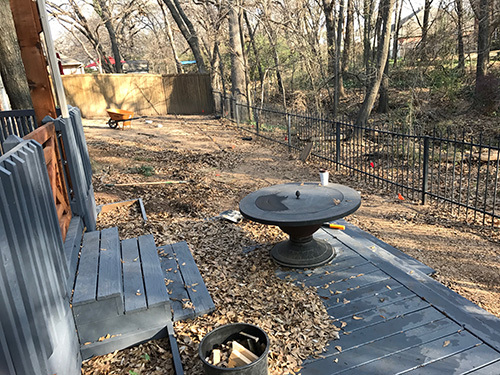 They dug up the existing flagstone path, raked up all of the leaves and debris from the trees and then borrowed a tiller to level the dirt. Our dogs had dug a million holes in that dirt part so it was very uneven. That part took a couple hours. 2) Step two was to build a flower bed/retaining wall next to the house to create a border for the synthetic grass. We also wanted to have the flower beds, with irrigation, alongside the house so we would be watering our foundation. Keeping the soil around your foundation moist helps prevent foundation cracks. 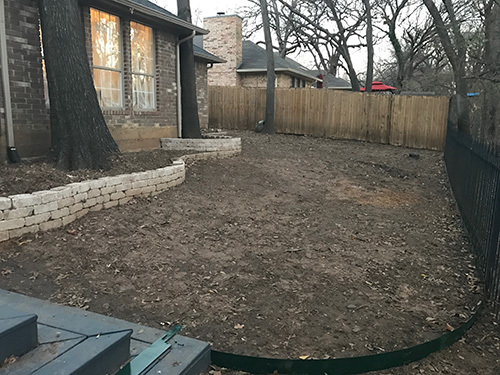 To create the flower beds, we used spray paint to draw our rough outline in the existing dirt and the guys dug a 2" channel and filled it with decomposed granite to serve as a leveling base for the stone retaining wall. 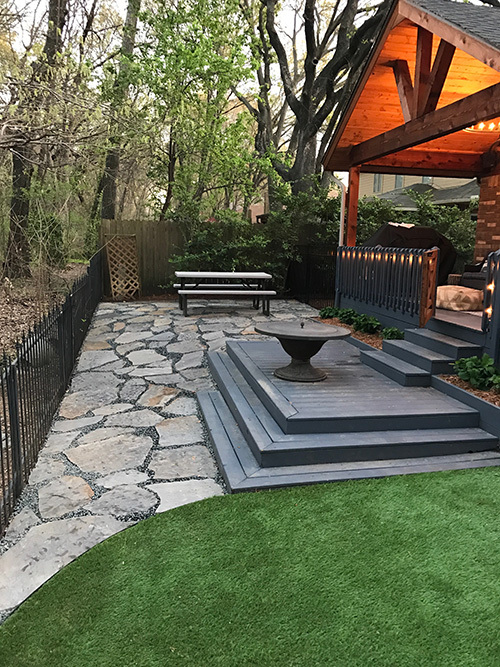 Once that was done, we placed the first layer of the stones - Pavestone Rumblestone in the cafe color and the trapezoid shape - on top of the leveling base. Because the ground was uneven, they had to use a tamper and level every time they placed a stone to ensure the wall would be level from start to finish and that stones placed side by side would be perfectly level with one another. You can see in the photos that the elevation changes as the retaining wall goes on, so they had to be very meticulous as they built the bottom layer. Just typing this makes my brain hurt and my patience wear thin. Thank goodness the husband is so detail oriented! Once the first layer of the stone wall was done, they continued to stack the stones. Laying the first level of the stone took 90% of the effort, and the rest was really simple. It's a freestanding stone wall, which means we don't have any mortar or glue holding the stones together. The weight of the stone and the leveled nature of the wall are wait maintain the integrity of the structure. That was Day 1. Because we have kids now and can't devote every minute to home projects, Scott would work all day every Saturday while I watched the kids. That went on for 6 weekends leading up to the big birthday party. Phew! 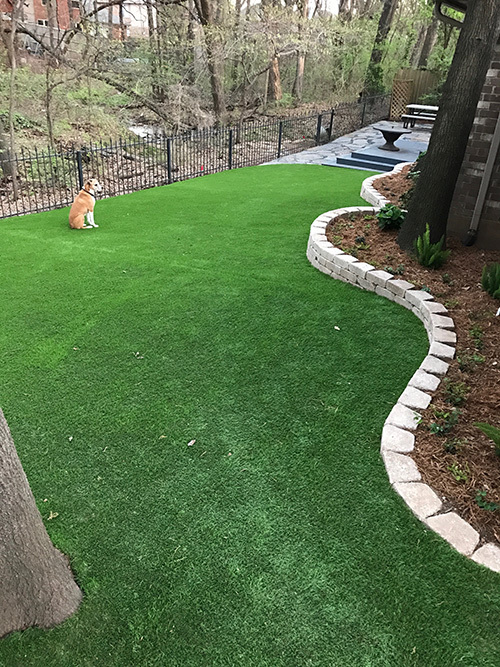 3) Once the stone wall was in place, Scott measured the remaining backyard to get the proper dimensions for the synthetic grass order. We purchased our turf from Synthetic Grass Pros, a local supplier. They were super helpful because Scott is nothing if not thorough - he asks A LOT of questions when he's taking on a big project like this. I know they were dubious about him doing it himself, but they answered all of his questions. 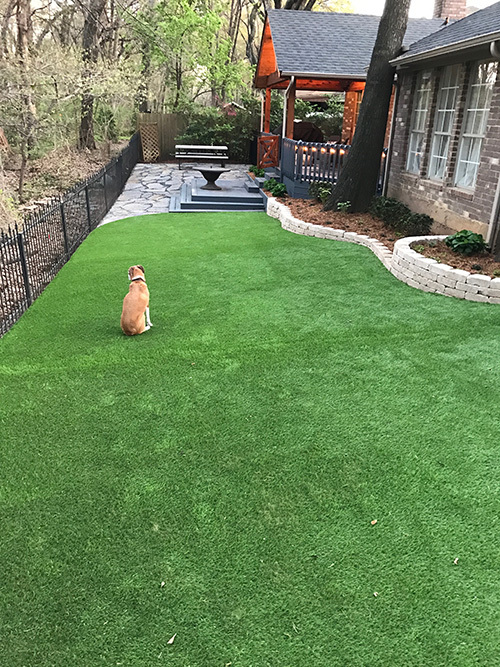 We found a synthetic grass that was on clearance because it had been discontinued (of course, you know we love a sale) so we ended up saving 55 cents per square foot. We bought 1,095 square feet, so buying the clearance turf saved us $600. 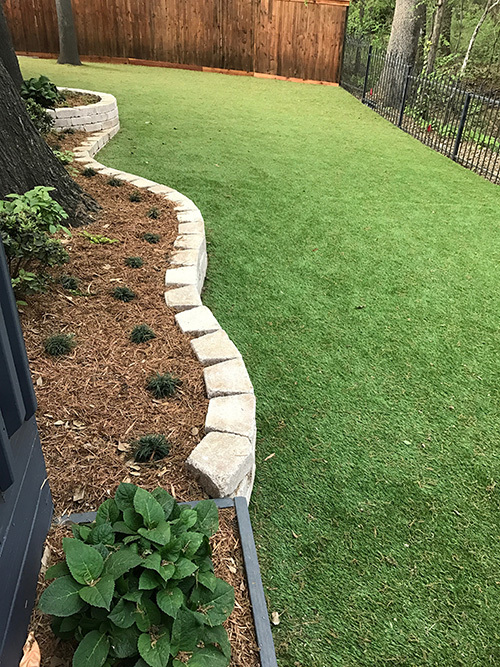 Our total cost for the synthetic grass, including the actual grass, 36 50-lb bags of silica sand, composite edging for the grass borders and 1,000 galvanized 6" staples, was $2,680. 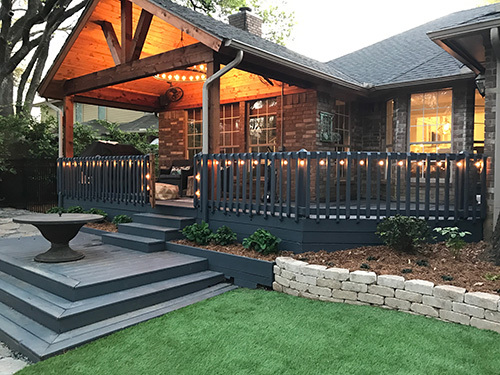 If we had used Synthetic Grass Pros (who had reasonable pricing for installation -- we really shopped around) to install the grass, it would have been more than $7,000. The next step was the lay metal edging that he bought from Home Depot to serve as the borders for the grass. You can see it in the bottom of the photo above. We went with a curve to mimic the curves of the flower beds and soften the hard corners of the deck. The edging runs alongside the deck and all along the iron fence separating our yard from the creek area. 4) Once the edging was in place, it was time to install the aggregate rock base on top of our existing dirt. 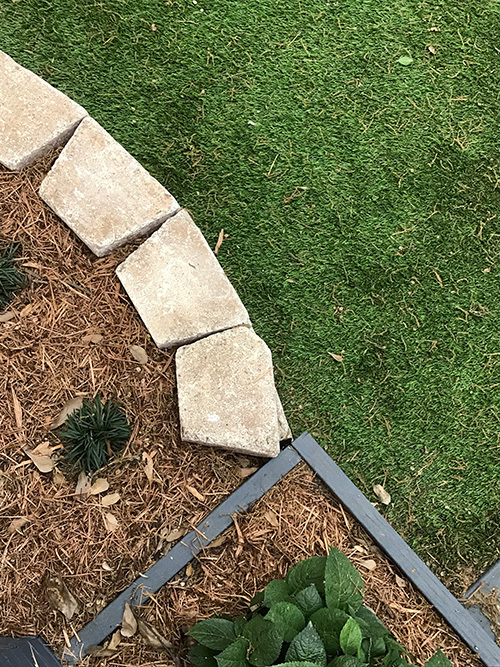 The bottom layer is 1" gravel, also known as 57 stone in the rock-buying world, and we needed 10 tons of it to create a 2-3" layer for the entire synthetic grass area. They rented a plate compactor from Home Depot to compact the rock into a smooth surface. We bought our 57 stone, which is a crushed concrete, from Big City Crushed Concrete. It was very affordable - $250, including delivery. Scott had 3 former football players (perks of being a coach!) shoveling and wheelbarrowing the rock into the backyard. The more manpower, the better. Note: This is another area where we saved money because Scott did a lot of research. Had we purchased 1" gravel that was actual stone, it would have been more expensive than the crushed concrete. 5) On top of the 57 stone, they laid a 1" layer of decomposed granite. Because this granite is so finely ground, it provides a smooth base for the grass. It packs down really well and is easy to form into a smooth surface while still allowing drainage. They used the plate compactor to tamp this layer down as well. 5) This is not relevant to every project, but they had to switch gears to the wooden fence at this point and install a new border at the bottom because that needed to be finished before the grass could be installed. So many moving pieces! 6) Once the fence was ready, then it was time for the grass. SO exciting! The grass comes in 15 foot rolls and is cut to whatever length you request. I wonder what our neighbors were thinking when they realized we were carpeting our backyard! Scott had a "cut list" where he diagramed all of his cuts to make sure he was cutting the turf in the most efficient way. That way he wasn't wasting any turf (basically throwing money away). It makes my brain hurt to explain it so let's just say it required much more patience and geometry skills than I could ever possess. Are you wondering how Scott learned how to install synthetic grass? YouTube, duh! Every night I would find him watching videos about installing turf. What a geek, right? But this geek saved us thousands of dollars by doing this himself so he's basically the coolest geek in all the land. He's my hero. I married up. If possible, install on a warm day so the material is more flexible. Always cut the black side, not the grass side. Change your blade more often than you think. Unroll the grass and let it sit for a few days, kind of like you need to do before installing hardwood floors, before you make any cuts. He didn't do that the first day and it was so much harder to cut than after her let it sit out flat for a while. 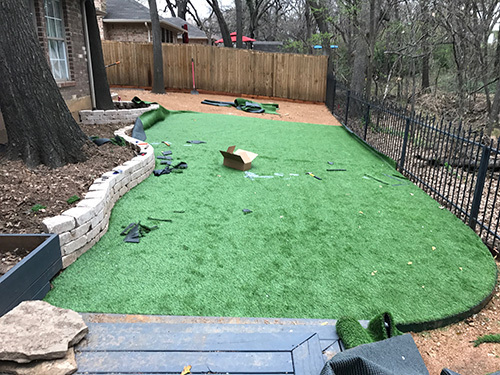 The process involves rough-fitting the turf in place, stretching it out as best you can, stapling the seams every 3 inches (using a rubber mallet to nail the staples into the ground), and then make your exact cuts around the edges. Those edges are secured with staples every 3 inches. I asked Scott how he would describe the process: "Labor-intensive. Tedious. Physically tiring." Still, they kept chugging along. Our party was coming up quickly at this point. The pressure was on! Once the grass is cut and stapled, the next step is to install the infill. 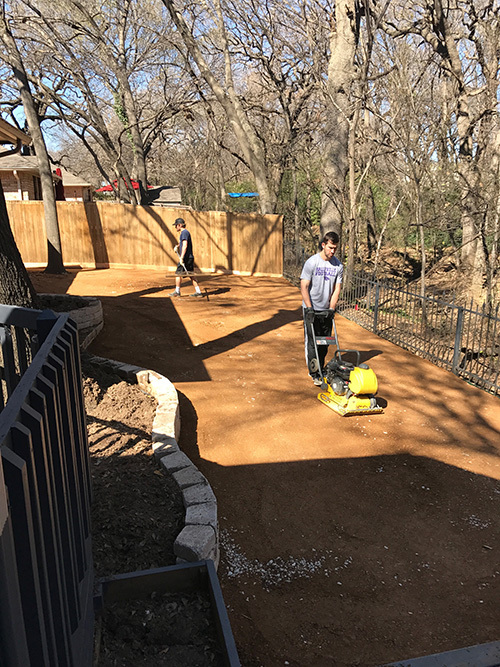 You apply about 2 lbs of silica sand per square foot on top of the grass, and you use a push broom to spread the sand around, going against the grain of the grass. The sand lifts the grass fibers, which had been flattened with the turf was rolled up, to look more realistic. It also weighs down the turf to prevent movement and make it feel a lot more like real grass. I can't tell you how exciting it was to look out the playroom and see green grass back there instead of dirt. The green color was so bright and saturated - it was beautiful. Finally, the grass was installed! Now we just had a million other tasks to finish before the party. 7) We decided to install flagstone on the other part of our backyard. 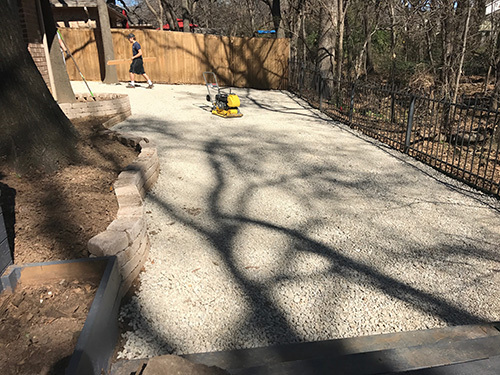 We worked with our good friend Charley Hellmuth to get some gorgeous Oklahoma Silvermist flagstone and Tejas Black Gravel from DFW Stone Supply. 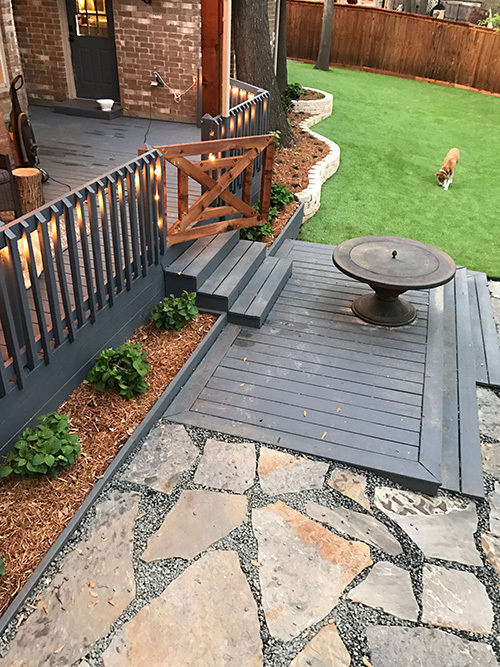 Charley recommended we do the Silvermist instead of trying to match the old flagstone we already had (regular Oklahoma) and I'm so glad we did that because the grey tones look so nice with our grey-blue deck color. Flagstone installation is easier to install than turf, luckily. 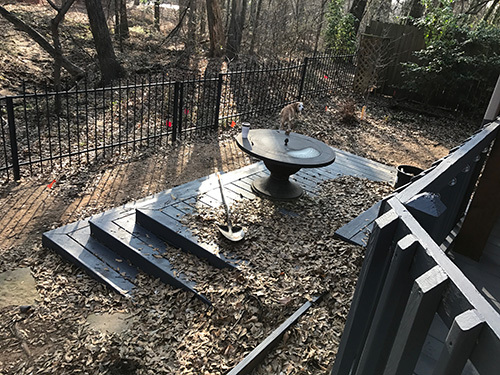 You still need decomposed granite on the bottom to create a level base, and then you lay the flagstone on top in your preferred pattern. You use the gravel to fill in the joints between the flagstone. 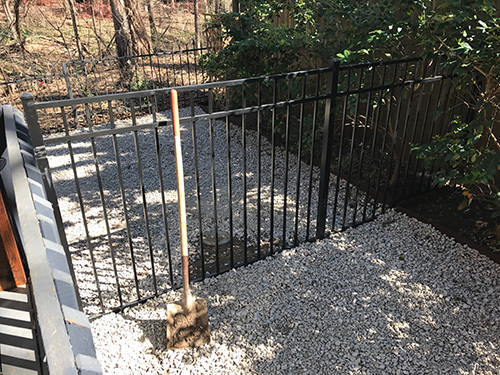 He also put a weed barrier between the decomposed granite and the flagstone to try to prevent any stubborn weeds from growing in between the stones in the future. 8) After the flagstone, they started working on the landscaping for the flower beds. We bought azaleas, hydrangeas, foxtail ferns, peonies and some ground cover plants that are all supposed to do well in shade or part sun. First the soil is laid, then the plants go in, then the irrigation is installed, and lastly the cedar mulch was applied. We hear that cedar is a natural insect repellant so we're hoping that helps during mosquito season. 9) Because that wasn't enough work, Scott decided to rebuild the two fences on the side of the house. He patches the bad boards, added trim at the top and bottom and restained it. It looks so much better now. The dogs had really destroyed those fences. Speaking of dogs, we have added this fence to create a dog run on the side of the house. They are no longer allowed to hang out in the nice part of the yard where the turf is. We have learned our lesson! 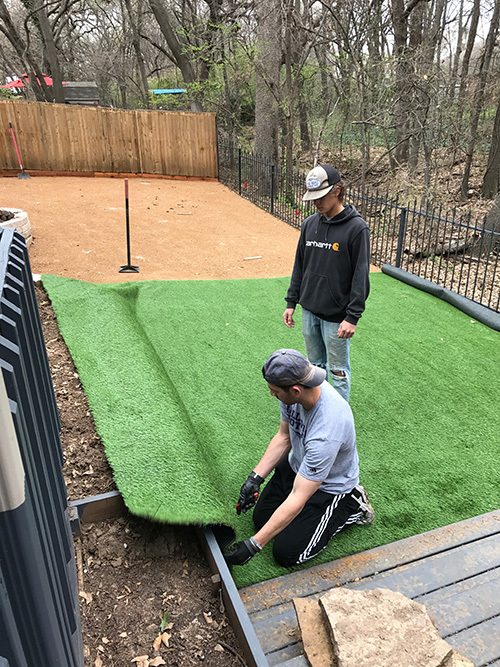 The last part of this project is to lay turf in their dog run, but that will come later. Can we get to the good part, the glorious after pictures? Don't mind if I do! It's probably the biggest home improvement project we've ever done. We spent a total of $8,250 when we added up the materials and labor. (Don't worry, we did actually pay those former football players for their hard work.) Of course that's not cheap, but we feel like we saved a fortune by doing it ourselves. We said all along that having a backyard was an investment for us that would be good for resale in the future because the previous dirt pit was such a terrible turn off. 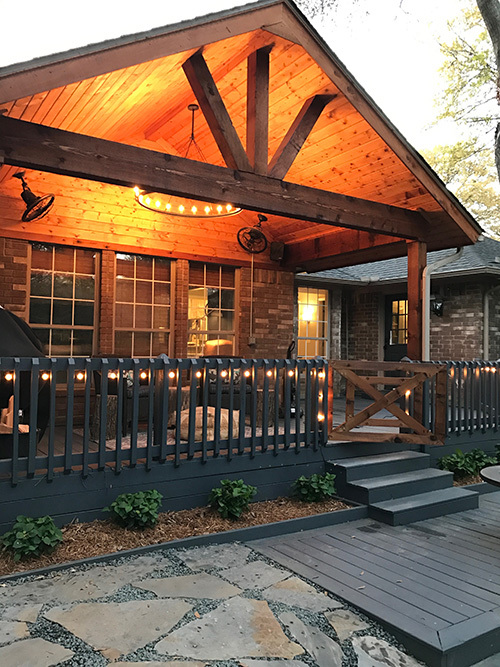 We felt comfortable spending the money, especially because our twins are almost a year old and they are at the perfect age to enjoy this backyard for many years. Also, it turns out that having twins really increases your tax return, so you better believe that check went straight to this project. Ha! We are already enjoying our backyard so much in the past 5-6 days since we finished. It was SO worth it. It feels so great to have an outdoor space for playing and relaxing. It only took my brother and Scott a couple of minutes to bust out the golf clubs back there for some chipping contests, and the kids had so much fun playing out there during the twins first birthday (which I will write another HUGE blog post about). You can see the aftermath below. We are so glad we finally bit the bullet and installed synthetic grass. 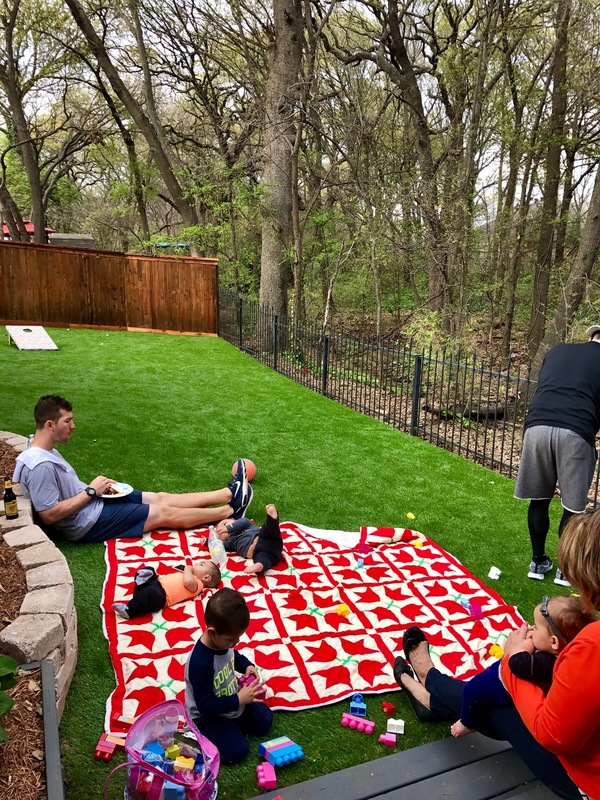 We couldn't be happier with our new backyard "carpet" and can't wait to break it in!